Roll-up tonneau covers are a great way to protect the bed of your truck without breaking the bank. Most of the models that you find online are going to be convenient, affordable, and look nice on the back of your truck. The issue with buying a new tonneau cover is the fact that there are more than just a few options, and different truck models fit will require different covers. So, which roll-up tonneau cover is best for your truck? In this guide, we are going to take a look at 10 different roll-up truck bed covers, take a look at which trucks they are compatible with, and help you find one that fits your needs. 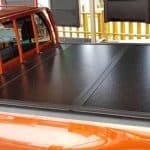 Before we begin, let’s take a look at some of the benefits of a roll-up tonneau cover and some of the features that you will want to consider when purchasing one for your truck. Size – Truck beds range in length, so if you have a mid-sized bed that is 6.5 feet in length, you do not want to purchase a tonneau cover that is 5.5 feet in length for your truck. Before you begin searching for a cover, make sure that you measure the truck bed. Compatibility – Not all truck models have the same bed width either, so before you purchase a tonneau cover that may leave gaps for the rain to get in, make sure that you check to see if it works with your truck. Installation Time – Most of the roll-up covers that you are going to find on the market are going to be simple to install without professional help, but you do not want to spend a long time doing it yourself. Try to find a cover that does not require drilling or special tools to be used during the installation process. Clamps and Velcro are common systems that are used to secure the covers, which means that it should never take more than an hour to install a roll-up cover. Durable Material – Most of these types of roll-up covers are made with an aluminum frame and vinyl material. You will want a material that is tear-resistant, water-resistant, and UV-resistant so that it lasts longer on your truck. Lightweight – Heavier options tend to be more secure, but if you are looking for a roll-up truck bed cover, a lightweight alternative could make it easier to roll, access the bed of your truck, and install or remove the cover. The Bak Revolver is a hard rolling truck bed cover that is designed to fit on the Ford F-150 as well as the GM Silverado / Sierra. These models are very similar in design; in fact, the main difference is the size of the vehicles. The cover that is made for the Ford F-150 is designed for vehicles that were created between 2015 and 2019 with a 5.5-foot bed, a 6.5-foot bed, and an eight-foot bed. The cover that is made for the Gm Silverado / Sierra is made for the same size truck beds, but it is going to be compatible with trucks from 2014 to 2019. Did you check our Truck Bed Extender guide? On both of these models, you will find that this roll-up cover is a great option that falls between a tri-fold cover and a soft roll-up. It is made out of hard aluminum that will roll up with easy. It is installed on rails that extend for the entire length of the bed, which means that the entire area will be secure. If you combine this secure railing system with a locked tailgate, you will find that it will add a lot of security to the truck. The material over the frame is vinyl, which is excellent for adding protection from the elements. The cover can easily be rolled up with one hand, so if you need access to one side of the bed of your truck, you should have no issues reaching it. Since this cover rolls up into a secure position, and there are straps to make sure that it stays secure, you can even ride with the cover open, which may come in handy when you need to haul a large load. If you own a truck, one of the best selling roll-up truck bed covers that you can find is going to be the Tyger Auto T1, especially if you have a Ford F-150. There are six different variations of this tonneau cover that you can consider for a Ford F-150. Many of the features are similar, but you will need to take the year of the truck and the bed size and style into account before purchasing one. The first three are designed to work with trucks with 5.5-, 6.5-, and eight-foot styleside truck beds that were made between 2015 and 2019. The latter three options are designed for any Ford F-150 that was manufactured between 2009 and 2014. One of the options is compatible with a utility track system, while the other two are not. The cover is designed with aluminum side railing and clamps that have been powder coated to protect them from the elements and keep them from rusting. The cover material itself is a durable vinyl that is designed to be tear-resistant as well. Once the cover is in place with clamps and Velcro in place, the tension can be adjusted at the rails to make sure that it is always secure. Installation of this roll-up cover should be simple, especially since drilling is not required. When the cover is rolled up, it can be secured near the cab of the truck to make sure that it is safe to drive with the cover open. This tonneau cover also comes with a limited lifetime warranty, which could be useful to have in the future. One of the best tonneau covers for the Dodge Ram 1500/2500/3500 is this Lund Genesis roll-up. This cover is designed to fit on any Dodge Ram 1500 with a model year between 2002 and 2018, while covers for the Dodge Ram 2500 and 3500 will only fit models that were manufactured between 2003 and 2018. This cover is made to fit both a 5.5-foot bed and a 6.5-foot bed, but it will not work with models that have a Ram Box attached. The cover is designed with aluminum crossbars, and the material that it is made of is a twill fabric that is designed to last. It is mold, mildew, and UV-resistant, so it will be able to protect your cargo quite well. It is also designed with hook and loop fasteners that can help you adjust the tension of the cover at any time. Installation of this cover will not require any drilling or special tools of any kind, and since there is a quick release option with this cover, you will have quick, convenient access into the truck from any side. In addition, the low profile of this truck cover makes it an excellent option for anyone who may need to haul larger loads from time to time. It can even be secured with included straps and buckles when you are on the road. This cover is also backed with a limited lifetime warranty, so you will not have to worry about the cost of repairs if something happens to the cover. The Gator ETX roll-up tonneau cover is a great option to consider as well, especially if you are looking for the best low profile tonneau cover for your truck. The cover is designed to fit a 2014 to 2018 Silverado/Sierra 1500 as well as a 2019 Legacy/Limited. With these models, you will be able to find a cover for a bed that is five feet, eight inches in length; six feet, six inches in length; or eight feet in length. 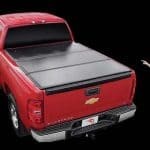 You can also get this truck bed cover for the same size beds that will be compatible with a 2007 to a 2013 GM Full Size. This tonneau cover is a great option to protect your truck bed and cargo from the elements. It is made with leather-grain vinyl that is extremely durable so that it does not rip during use, and it is water-resistant. This cover is designed to be easy to install and even easier to use. It does not require drilling during the installation process, and the rail can easily be clamped on to the bed of the truck to secure it within 15 to 20 minutes. 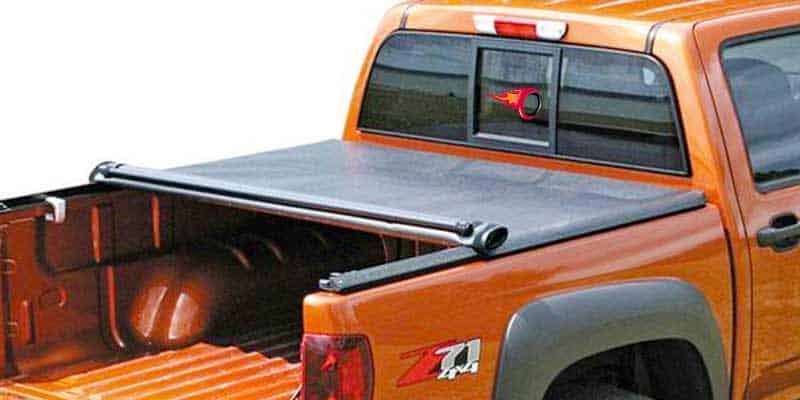 When you need access to the bed of the truck, the cover has a quick release that is located near the tailgate on the driver’s side that will allow access to the entire bed of the truck. There are also buckles that are located near the cab of the truck that can be used to secure the cover when it is rolled. In addition, the low profile of this cover makes it easy to see out the back window during your travels, even when it is opened for larger cargo. The Gator ETX also comes with a limited lifetime warranty to back the quality of the product. TruXedo is a well-known company when it comes to tonneau covers, and it is one of the best options to consider for roll-up truck bed covers. The Lo Pro is a great soft cover that is designed to be compatible with several different truck makes and models. It works well with a 2014 GMC Sierra or a Chevrolet Silverado 1500 with an eight-foot bed, but it also fits a 2015 to a 2019 GMC Sierra and a Chevrolet Silverado 2500/3500 with a 6.5- and an eight-foot bed. If you prefer a Ford, this tonneau cover is also compatible with the any Ford F-150 that was manufactured between 2015 and 2019. There are models for the 5.5-foot bed, the 6.5-foot bed, and the eight-foot bed. The low-profile design of this cover will give your truck a sleek, stylish look, and it will not obscure your back window in any way. The cover is made from a tear-resistant leather fabric that is designed to be durable enough to protect your cargo from the elements. It is simple to install, and no tools or drilling will be required to complete the process. There is a quick release feature that allows you access to the bed of the truck in minutes, and it can be secured in place so that traveling with the cover off is possible. Another Truxedo tonneau cover that you may want to consider is the Truxedo Truxport, Which is compatible with the Ram and the Toyota Tacoma. If you have a Ram 1500, the cover is designed to fit any model that was manufactured between 2009 and 2018 with a five-foot, seven-inch bed. When it comes to the Ram 2500 or 3500, the cover will fit on a six-foot, four-inch bed or an eight-foot bed that was created between 2010 and 2018. If you have a 2016 through a 2018 Toyota Tacoma with a five- or six-foot bed, this cover will also be compatible with your truck. The low-profile of this cover adds sleek, aerodynamic contours to your truck that will not only look great, but they will help you save fuel by improving your vehicle’s MPG. It is made from a durable, high-grade vinyl that is held in place with industrial-strength Velcro. You can also tighten and adjust the tension of the cover with ease. Installation is also simple to complete, especially since no drilling is required, and the cover is secured with clamp-on rails that should take as little as 20 minutes to install. When you need to remove or roll up the cover, the process is just as simple, and it can be secured at the cab of the truck so that driving with larger cargo is possible. In addition, there is a five-year warranty that comes with this tonneau cover. The MaxMate roll-up truck bed cover is a great option that works well with quite a few different trucks. The material that the cover is made out of is a marine-grade vinyl, which is designed to be weather-resistant and tear-resistant. It has powder-coated, aluminum rails and crossbars that will offer quite a bit of durability to the cover as well. The sides of the cover are designed to be secured with heavy-duty Velcro straps that keep the water out, and if the cover seems to be sagging, there is a convenient way to adjust the tension. Installation is very simple; in fact, the instructions are provided for you, they are easy to read, and tools or drilling are not required for installation. It can also be secured in an open position so that you can haul larger items in the bed of your truck. It can be installed with a utility track or without one, and there is also a 10-year warranty that comes with the purchase of the tonneau cover. A 2014 to a 2019 Chevy Silverado/GMC Sierra 1500 with a five-foot, eight-inch fleetside bed without a utility track system. A 2014 to a 2019 Chevy Silverado/GMC Sierra 1500 with a 6.5-foot bed and no utility track. A 2015 to a 2018 Silverado/Sierra 2500/3500 with a 6.5-foot bed and no utility track. A 2014 to a 2019 Chevy Silverado/GMC Sierra 1500 with an 8-foot bed. A 2015 to a 2018 Silverado/Sierra 2500/3500 with an 8-foot bed. A 2009 to a 2018 Dodge Ram 1500 fleetside five-foot, eight-inch bed without a Ram Box. A 2002 to a 2018 Dodge Ram 1500 fleetside 6.5-foot bed without a Ram Box. A 2003 to a 2018 Dodge Ram 2500/3500 fleetside 6.5-foot bed without a Ram Box. A 2002 to a 2018 Dodge Ram 1500 fleetside 8-foot bed without a Ram Box. A 2003 to a 2018 Dodge Ram 2500/3500 fleetside 8-foot bed without a Ram Box. A 2009 to a 2014 Ford F-150 5.5-, 6.5-, and eight-foot styleside bed without a utility track. Another great soft roll-up tonneau cover that you can consider if you own a Toyota Tacoma, a Chevy Colorado, or a GMS Canyon is this one from North Mountain. The cover that is designed for the Tacoma will only fit trucks that were manufactured with a model year between 2016 and 2018, and they must have a five-foot truck bed. For the Chevy Colorado and the GMC Canyon, there is a wider range of years because of the six-foot bed, so it should fit any model from 2004 to 2014. It is made from aluminum crossbars that are designed to have a very low profile on the back of your truck. This makes your truck more aerodynamic, so you may save a little bit of gas with it. It has a tear-resistant vinyl material over the frame that is also designed to keep the water out of the bed of your truck. The cover rolls up easily, so if you need more space for larger items, you will even be able to drive with the cover open. Installation is simple as well with this cover. No drilling is required for the installation process because everything is clamped on to secure it. In fact, installing this tonneau cover on your truck should take less than 20 minutes. The cover is also backed by a three-year warranty, so defective parts and issues will not come out of your pocket. One of the best aspects of owning a roll-up tonneau is how easy they are to install on most vehicles, and this T2 roll-up, which comes from Tyger Auto, is a great example of an easy-to-install tonneau. When installing this product, you won’t need to drill any holes at all; in fact, the clamps that come with the T2 attach very easily to your bed rails. See our: top Bed Mat picks for your Truck! The fabric of this roll-up is made of ultra-durable vinyl, and the side rails are powder-coated aluminum, which won’t rust or corrode, even after long years of use. The tonneau itself uses Velcro to guide the process, and this material, which is industrial-grade, also helps prevent moisture from making its way into the bed. Tension is absolutely crucial in a roll-up tonneau because a loose tonneau is less protective, which is why the tension is adjustable via a tensioner near the latch of the tonneau. This tonneau is also designed to prevent the pooling of water using a crossbow design. The aluminum bows at the rear and middle of the product project upwards at the middle so that water is more inclined to run off the tonneau during harsher weather. To lock and unlock the tonneau, there is a pull wire at the end that will allow you to roll up the tonneau easily. This particular model of T2 comes in several variants that work for different truck models that may have different bed features. This includes part number BC2C2060, which is compatible with the 2014-2019 Chevy Silverado and the GMC Sierra 1500. This particular version of the T2 is designed for the model with the 5.8-foot bed that does not include the Utili-Track system. In addition to this model, you can also find part number BC2C2059, which fits the same model with the 6.5-foot bed without Utili-Track. Finally, part number BC2D2064 fits the Dodge Ram model from 2009 through 2019. This model features a 5.8-foot bed and doesn’t include the RamBox. The Lo Roll product line from Tonno Pro is a good option for anyone that needs an all-weather product due to the fact that it’s water-resistant, snow-resistant, and is designed using a durable black marine-grade material that won’t be damaged by easily the sun. How does it prevent water from getting into the bed? Well, not only does the industrial-grade Velcro to create a weather-resistant seal, but the tonneau also can use a bulkhead filler gasket to provide a block for moisture of any type. Additionally, the product is snow-resistant thanks to the vertical tube supports that fall into the side rails. These tubes greatly support the tonneau so that accumulated snow won’t cause the product to collapse in on itself under the weight. The vinyl material is also designed specifically to be tough against impact and tampering as well. The material won’t tear over time, and it’s very difficult to puncture. When installing the product, you’ll need the included C-clamps, which require a socket wrench for a sturdy connection. In total, it should take about 25 minutes to install the Lo-Roll on your truck. Tonno Pro has designed this roll-up cover for a relatively wide variety of truck models. For example, there are models that cover the 2014 through 2018 versions of the Chevy Silverado and GMC Sierra 1500. In fact, the Lo-Roll even has two variants that work for both the 5.8- and 6.6-foot beds of these vehicles. Have a larger truck? Fortunately, you can also find a model that fits the eight-foot beds of the Silverado 3500 as well as the Sierra 2500 HD. Affordability – During your search for truck bed covers, you have probably run across models that cost quite a bit, but if you find yourself on a budget, these roll-up tonneau covers can be purchased for less than $300. Easy to Install – Roll-up tonneau covers are very simple to install because they are very light and easy to manage. In addition, the installation process does not require drilling because of the clamp system that is designed to attach to the bed rail in your truck. Attractive Materials – When it comes to material, you will have options to select from. All of them will be lightweight, attractive, and have a low profile. This means that you will be able to roll them up for trips without blocking the back window. Truck Bed Access – When the cover is rolled up, you will have full access to the bed of your truck form both sides as well as the tailgate. Roll-up tonneau covers are a great option for anyone who is looking for a sleek cover for their truck. They can protect your cargo from the rain, keep debris out of the bed of your truck, and help you save gas by improving your gas mileage. With that being said, there are several different options to consider. Hopefully, this guide has helped you find the right roll up truck bed cover for your needs; depending on the make and the model of your truck, we have likely reviewed several compatible options for you to consider.